The Moto Insta-Share Projector lets you project your Moto Z screen up to 70″ on a wall or other surface. 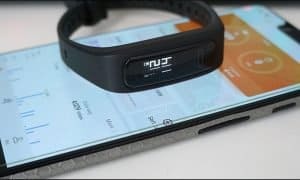 While there are options to share your smartphone screen to TVs and other devices, what happens if you’re not around a TV or the one you happen to be around doesn’t have a streaming option? 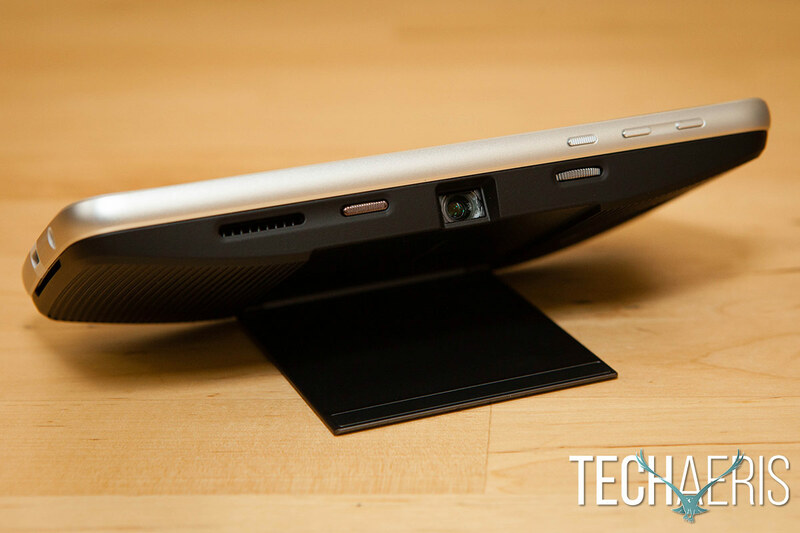 Our Moto Insta-Share Projector review takes a look at one of four current mods available for the Moto Z smartphones, allowing consumers an easy way to share the screen from their phone. In case you missed them, be sure to check out our Moto Z and Moto Z Play review, as well as our Incipio offGRID Power Pack, Hasselblad True Zoom, and JBL SoundBoost Speaker reviews. The Moto Insta-Share Projector comes with a carrying pouch. Out of all the Moto Mods, I think the Moto Insta-Share Projector has the neatest design. The front of the projector is split basically into three sections: the top — which has a cutout for the Moto Z camera, the middle — which is a slim metal piece on a hinge with two rubber strips on the top and bottom, and the bottom — which if you look closely enough you’ll notice an air vent with a very small fan inside. Both the top and bottom sections are ribbed which gives it an interesting look. Moto Insta-Share Projector on the Moto Z. The right edge houses a USB Type-C port, and as previously mentioned the hinge for the metal piece which we’ll get to in a second. The left edge of the projector is where you’ll find an air intake vent, the power button, projector lamp, and finally the focus wheel. The back of the projector has the standard Moto Mods Connector, notch for assisting with removal from your phone, and the battery level button. Like the other Moto Mods, when the button is pressed the light will turn green for 51-99% charge left, orange for 16-50% charge left, and red for 6-15% charge left. While charging, the light will slowly blink green, and when fully charged will rapidly blink green or turn steady green. When using the Moto Insta-Share Projector, simply pull out the metal piece which acts as a stand for the projector and the phone. While the hinge does go just over 180° back, you’ll probably mostly be using it between the 0 and 90° positions. As with the JBL SoundBoost Moto Mod, this one will increase the thickness of your Moto Z by over three times, and the Moto Z Play by just under three times. 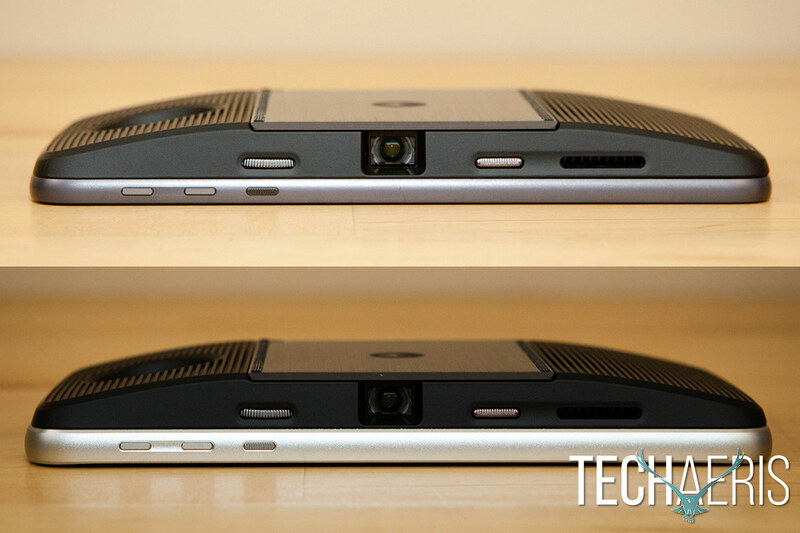 The Moto Insta-Share Projector on the Moto Z (top) and Moto Z Play (bottom). 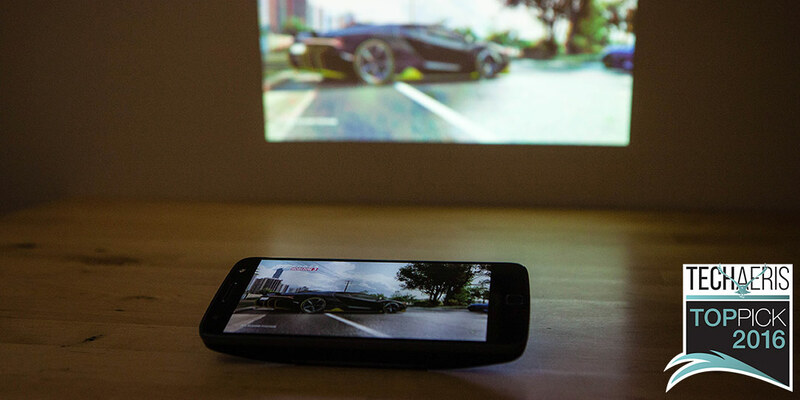 The Moto Insta-Share Projector only has a 480p display and projects up to a 70″ diagonal image. To be honest, in the right lighting conditions, the image is pretty crisp and clear once focused, and it is definitely great quality for only being a 480p display. While it does project well up to 70″ (I tested this on my projector screen), the colour and brightness seem best suited for anything less than a 50″ diagonal image. The Moto Insta-Share Projector projecting onto a light brown wall. I’m not an engineer, but I’d love to see a future version with a 720p or even 1080p resolution. There’s really not much to say here, like the other Moto Mods the Moto Insta-Share Projector is easy to use and performs as expected. Simply place it on the back of your Moto Z or Moto Z Play smartphone, press and hold the power button for a couple seconds until it turns on, and angle the stand to display the image on the wall or ceiling. 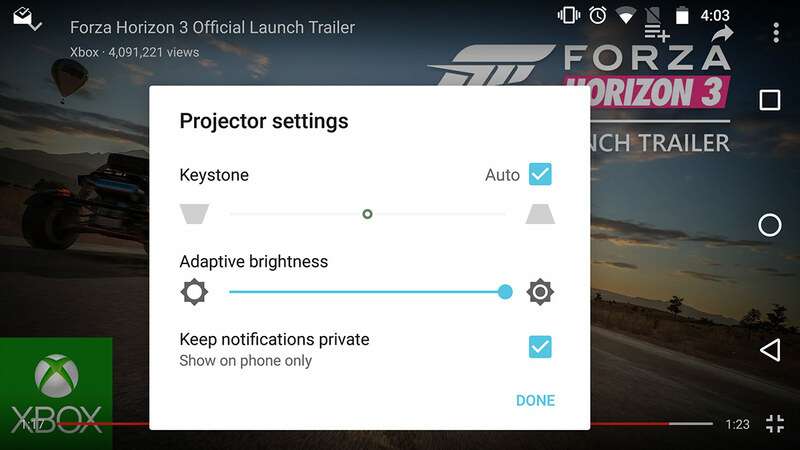 The projector also has automatic keystone image correction and it works quite well, but you can also go into the settings by pressing the power button when the projector is on to manually adjust the keystone and brightness of the image. In addition, you can set it so that any incoming notifications will display only on your phone and not get projected onto the wall for everyone to see. When you’re done using the projector, simply press and hold the power button to shut it off. The projector does have its own battery, unfortunately, it offers a mere 1 hour of battery life before it starts pulling power from your phone. Even though it has a USB Type-C port on the right edge of the projector, the orientation of the Moto Mod when placed on your Moto Z has this facing down towards the table and you can’t get a USB-C cable into it. However, you can still plug your phone into a power source and Motorola indicates that this is the best way to charge your phone (first) and the projector (once the phone is charged) at the same time. Battery life could definitely be better, and this is one instance where I could see a stackable battery Moto Mod sandwiched in between the Moto Z and the Moto Insta-Share Projector coming in really handy. 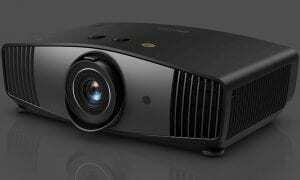 As the projector doesn’t have its own speakers, and understandably so given the small size of it, it relies on the speakers in the Moto Z or the Moto Z Play. I’ll just reiterate what I mentioned in my review of those devices. Both versions of the Moto Z have a single speaker, but music and videos sounded o.k. 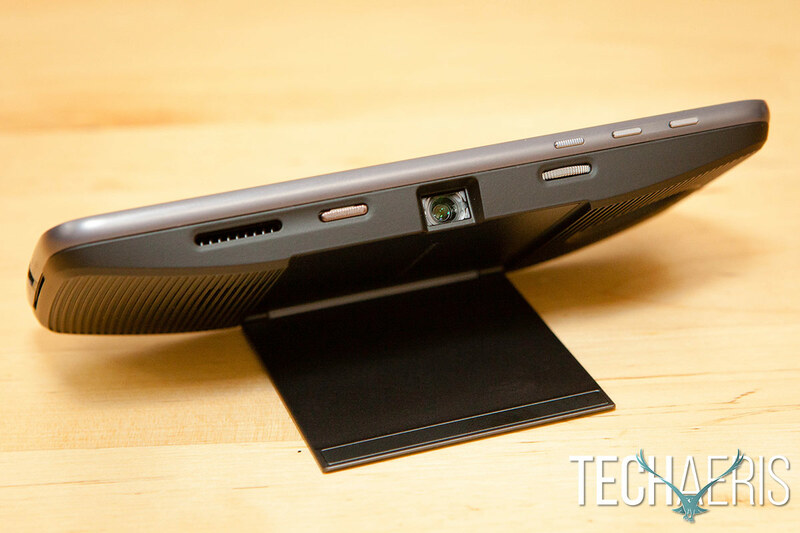 from the front facing “loudspeaker” (as Motorola refers to it in their specifications). Volume from both was about the same, and at maximum volume the levels were decent and there wasn’t any distortion, but there also wasn’t a very good bass response either. What you can do though is pair your phone with an external Bluetooth speaker or use a pair of earphones (wireless on the Moto Z or wireless/wired on the Moto Z Play) for better sound while using the Moto Insta-Share Projector. Moto Insta-Share Projector on the Moto Z Play. Coming in with an MSRP of $299.99USD ($399CAD), the Moto Insta-Share Projector is one of the two more expensive Moto Mods. Depending on your usage, it could be really handy to be able to share presentations or watch videos from your smartphone without having to hook it up to an external projector. 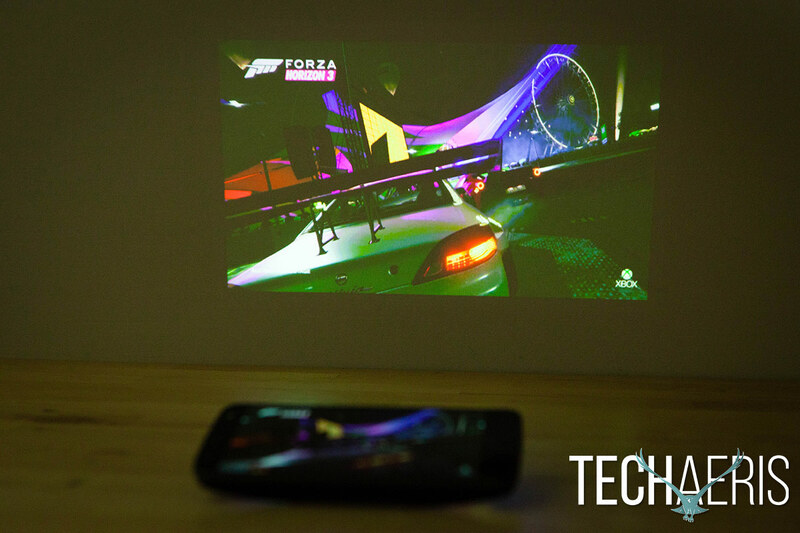 For the size, the Moto Insta-Share Projector throws a pretty impressive picture. The Moto Insta-Share Projector isn’t for everyone, not to mention a bit on the pricey side, but it certainly has its uses. It’s a great Moto Mod for business use, and can even come in handy for watching videos or movies in a pinch. 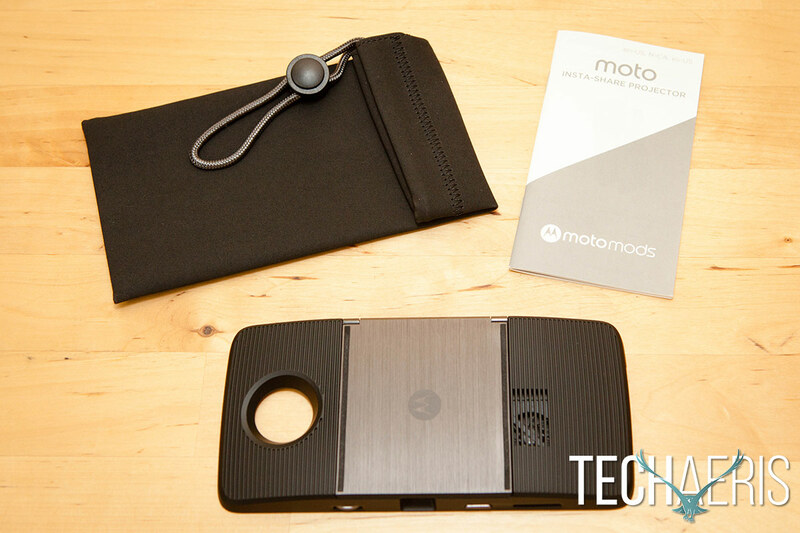 It’s definitely the Moto Mod that garnered the most attention while demoing the system to others. Even though it’s not for everyone, it definitely showcases what’s possible with Moto Mods and performed way better than we expected and that’s why it’s received a Top Pick of 2016 award. Clear, bright picture. Automatic/manual keystone adjustment, brightness adjustment. Private notifications setting. Pricey. Only 480p resolution. Battery only lasts an hour. 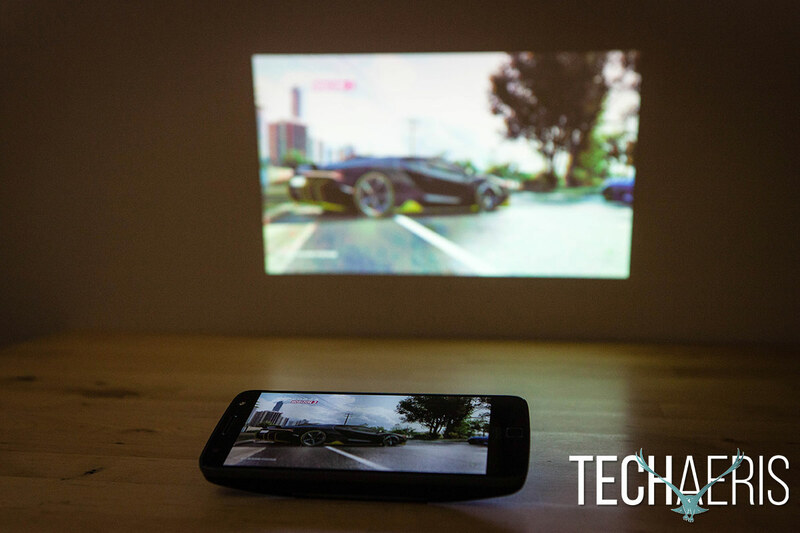 The Moto Insta-Share Projector isn't for everyone, but it certainly has its uses. It's a great Moto Mod for business use, and can even come in handy for watching videos or movies in a pinch. *We were sent a demo unit of the Moto Insta-Share Projector Moto Mod for the purposes of this review.